Beautiful, bespoke shutters not only look incredible; they are a perfect, valuable and practical addition to any home. Manchester has an eclectic mix of architecture. The area boasts buildings from the time of the industrial revolution through to cutting-edge designs of the modern day. Do you have a converted warehouse apartment in need of that perfect design touch? Perhaps a modern city pad needing maximum light and space? Or even an Edwardian baroque townhouse? Whatever type of home you have, we at Just Shutters have the style and finish that will compliment it perfectly. We have over 7000 happy customers. With our experience and complete focus on customer satisfaction, you can be assured we will treat your house like a castle! Shutters are purchased because they look great. They make a design statement that is crisp, fresh, clean and create a style and ambience no other window covering can. But more than this, shutters have many other fantastic ‘selling’ points. – Long lasting value: while they are considered a luxury product in terms of quality and finish, shutters provide excellent value. Our shutters come with a lifetime guarantee. – They are low maintenance: a quick dust with a damp cloth or feather duster keeps them looking brand new. – They don’t mould, mildew, dust or sun damage! Shutters are not subject to moth or other insect damage like other fabrics or untreated woods. – Shutters offer light and shade control. – They aid overall noise reduction. – They offer added security. By adding an extra layer of protection to your windows or doors and providing a private environment. – They are allergen reducing: shutters do not hold dust and spores that cause allergies the way soft furnishings do. Shutters are perfect for allergy sufferers, asthmatics or those suffering eczema. Just Shutters have an unrivalled reputation. We are the interior plantation shutter specialists. We don’t sell shutters as part of a larger range, they are all we do, all we design and all we install. Whether it is our ladies in the office, or the person installing, at any stage of contact you can be sure that we are the experts at what we do. Please see our independent reviews on Checkatrade for assurance that we always put the customer first. We would be delighted to visit your home and give you the opportunity to see samples at your windows and discuss shutters with our expert. You can book your appointment directly to the top right of this page, or call us on 0161 413 4525. You can download our brochure here and browse our galleries here to see for yourself the beautiful products we so enjoy. We hope to hear from you soon. 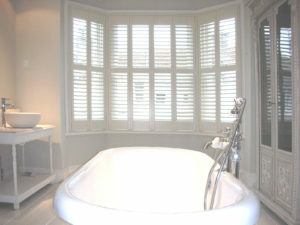 You may also like to see Plantation Shutters Cheshire.